Ready to get that fire burning? No, not yet! You have a site selected and have your water to put it out, but you first need to gather your fuel. There's a lot more to this than throwing a couple sticks in a pile and tossing on a lit match. Keeping with our theme of 3 from the fire triangle, you need to gather three different things to burn - tinder, kindling, and fuelwood. If you want a good fire, you need to carefully select each of these items. Before we get into tinder, kindling, and fuelwood, I want to mention that its a really, really good idea to make yourself a personal fire kit as well as a personal first aid kit. A fire kit contains everything you need to get a fire started and there's more about that on the fire starters page. Dry and fluffy - that's the key. Your fire starts from tinder - without tinder, no fire. In modern times, a match serves the purpose of spark and tinder. So, you could possibly skip tinder if you have a good supply of matches. But, starting with a small pile of tinder will make things so much easier for you. Tinder is about as big around as a needle or a string. Tinder can be any dry, easily lit, shredded material. Some good examples include cedar bark, grass, pine needles, wood shavings, pitch, milk weed fluff, char cloth, clothes dryer lint, or wax. Finding tinder can be a challenge in damp weather, but that is when it is most important. You can always create wood shaving tinder from inside a split log if all the grass and bark is damp or keep some char cloth in your fire kit. Once tinder has caught fire, it's heat can get larger pieces burning. These larger pieces are called kindling and they are not really all that big. Kindling is usually little splinters of wood, small twigs, or fuzz sticks. A greenhorn mistake once tinder catches is: too much, too big, too fast. Many fires have been smothered from dropping big sticks onto a small flame. Take your time and build from miniscule to tiny to small to healthy flames. Just as with tinder, it is important to have dry kindling. If its damp, split wood and collect the dry inner bits. Even split small sticks and twigs to expose the dry inner surfaces. Use a knife to whittle away the damp bark before using sticks if necessary. Pine makes better kindling than the hardwoods because it is easier to split down and catches faster. Kindling typically has the diameter of a match up to the size of a pencil. You should be able to snap kindling with your hands. I bet you are thinking of using big logs like are used in cozy log cabin fireplaces. Not out here! Fuelwood in a campfire doesn't need to be bigger around than your wrist. For big, entertaining campfires, your forearm is a good size estimate but there's no need to burn anything larger than that. Fuelwood is the life of the campfire. There is a heart of hot coals now and as long as you continue to feed fuel, the fire will continue to live. Fuelwood can be damp because the heat of the fire will dry it and then it will combust. But, don't be tempted to stack damp wood close to your fire in the hopes of drying it out - that is just asking for trouble. Different woods have different burn qualities. Hardwoods such as oak and maple burn hot and long while pine burns fast with more soot. Depending on the environment, you may not have much choice in your wood selection. Even though there are three main categories of fuel - tinder, kindling, and fuelwood - use your brain and understand that there are really fuzzy lines between the categories. 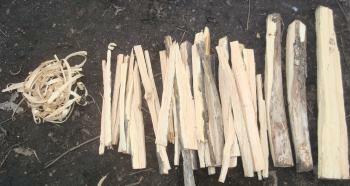 A particular stick could be kindling or fuelwood, depending on the current size of the fire and how big it needs to be. If your tinder has just produced a flame, don't put pencil-sized kindling on it - use match-size pieces instead and work up to the pencil-sized pieces. I sort out all my wood before starting a fire. I have the wood piled in increasingly large pieces so I can start from one end and work my way up and that works well for me. Only collect wood that snaps and breaks. If it bends, it is too moist to burn. Collect at least twice as much as you think you'll need - three times as much is better. Collect only down wood. Do not cut down trees even if they are dead. Collect your fuel BEFORE setting a spark - your fire will go out while you are looking for more fuel. Gather wood far away from camp so you do not strip the site. Pine needles and Pine cones are good for fire starting. Leaves are poor for fire starting. There is little room for air. Forked Tree - Place your branch between the two trunks and push the branch against one trunk. It will break where it contacts the trunk. Be careful not to fall forward when the branch breaks. Over Your Knee - Hold both ends of the branch and put your knee in the middle. Lift both ends, pressing your knee against it until it breaks. Works fine for smaller branches, but don't force the size. Under Your Foot - Lay the branch on the ground and place your foot on it where you want it to break. Lift one end until it snaps. Lift with your legs, don't bend over and lift with your back. Foot Stomp - Lay the branch on the ground with one end on a rock or log between 6 and 12 inches tall. Stomp down on the branch where you want it to break. Be careful of the broken piece bouncing up from the ground. Whack It - DO NOT swing your branch like a baseball bat against the trunk of a tree. It will break where it hits the trunk. The broken piece will fly off and poke a hole through your tent or your buddy. And, your hands will sting from the impact. See Saw - DO NOT lay the branch across a rock or stump and have your buddy bounce on the other end. You'll both get dirty, sore butts and probably cuts from flying splinters. I love this!!!!! It taught me how to build a fire while in the woods.